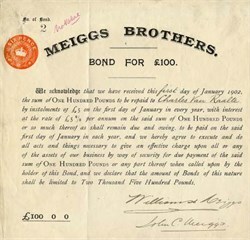 Beautiful 100 Pound Bond Certificate from the Meiggs Brothers dated in 1902. 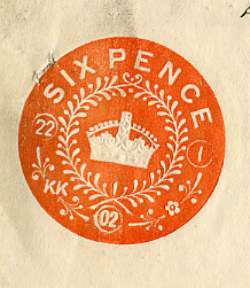 This historic document has a six pence tax stamp. This item has the signatures of the Company's officers, William Meiggs and John C. Meiggs and is over 106 years old. The certificate was issued to Charles Van Raalte.